Joseph Bergman House. From Wikipedia. Image by Eaaumi, 12 Jan 2010. The Joseph Bergman House is a two-story building of balloon frame construction on a basement story. 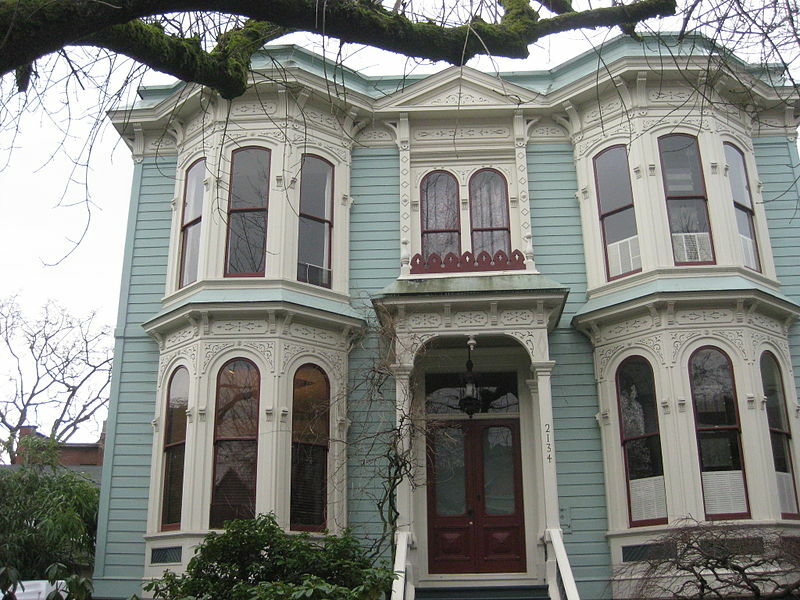 A well-preserved example of the High Victorian Italianate style of architecture, it is one of only twelve "symmetrical bracketed villas" remaining in Portland, Oregon. It is located on tot 7 of Block 18 of King's Second Addition to the City of Portland. It is situated on a 50x100-foot lot on the south side of NW HOyt Street, between NW 21st and NW 22nd Avenues. This area is commonly referred to ejs the Nob Hill neighborhood. This two-story house was built in 1885 by Amos King and sold to Joseph Bergman in 1890. The ground plan of the house is 34'10" by 39'10". It has 2,924 square feet of living space in its nine rooms. The house rests on a brick foundation approximately four feet high with a stucco finish. The basement is 105 inches high, floor to ceiling. The balloon frame is covered by eight inch clear cedar shiplap siding. There are corner boards and a belt course at the second story level. The formally-placed two-story polygonal fc(ay windows have three round-arched, one-over-one double-hung windows on the first floor and three segmentalarches, one-over-one double-hung windows on the second floor. A small, hip-roofed, arcaded porch with square columns with capitals and bases shelter the central entry. The front door is a double-leaf door with top-light. Above the porch, on the second floor, is a pair of round-arched windows with an Eastlake-style framement crowned by a pediment with incised ornament filling the tympanum. The low-pitched hip roof has a bracketed cornice in which decorative brackets are arranged in pairs. The frieze and spandrels are decorated with panels of incised ornament. The interior is formally organized on a central-axis hall plqn and contains nine rooms and a pantry. The first floor has two matching parlors 16' by 15'2", divided by sliding doors 7'3" wide by 10' high; a study, 16' by 15'2"; and a kitdhen, 12' by 15'2". A 7' wide central hall contains the stairway, hall and a 7'5" by 7'2" pantry with original cupboards off the kitchen. There is a fireplace in the study and a chimney between the kitchen and the west parlor. The second floor has four bedrooms with walk-in closets and a bathroom. The bedrooms measure 15' by 15', 14' by 15', 14' by 15', and IT by 12'. There are two flights of stairs: one ascending and descending from the entry hall in the center of the house and one off the west rear bedroom (prdbably the maid's room), which leads to the kitchen. and replaced by sheetrock in all rooms except the halls and the front and back bedrooms on the upstairs east side. All original woodwork was replaced except the plate rail in the kitchen and front west parlor. The ceilings had decorative plaster rosettes that have been lost except for the ones in the front east bedroom and front west bedroom. Piping for the original gas lights is still in place in most of the rooms. A back porch was removed. The Bergman House is surrounded by apartment houses. The apartment houses on either side are relatively new, the next one toward ! 22nd Avenue dates from the 1930s. The one on the corner of 22nd and Hoyt is a court-style brick building, now a condominium. Across the street, there are small 1930s style houses, one Victorian house and four apartment buildings. None of the buildings has a large front yard. Only one house across the street has a driveway and garage. Both of the apartment houses on either side of the Bergman house have large parking areas in front of the buildings. The traffic is heavy and parking is a problem. The Bergman house and the Victorian house across the street are the only old-original houses left in this area. There are two trees in the parking strip in front of the house. Separating the lot from the street is a low stone wall. Two rhododendrons flank the sidewalk leading up to the stairs to the porch. On the sides of the sidewalk are low shrubs. Acanthus plants are planted in the small front yard placed behind the stone wall. A Japanese maple is planted on the west side of the house; a silk tree on the east side. On the east side of the house is an alley. The small backyard is undeveloped. Hardsurface parking areas for neighboring properties abut east and west lot lines of the Bergman House. to be the oldest building in the Nob Hill neighborhood, being antedated only by the Couch family school house of 1884. The Bergman House is locally significant also under National Register criterion "b" for its association with its original and subsequent owners. Amos King (1822-1901), for whom the house was built, arrived in Portland in 1849 and purchased 500 acres west of the city on which King's First and Second Additions are now situated. The house is an illustration of King's real estate entrepreneurship. He never lived in it. Joseph Bergman (1829-1916), the second owner of the property, was a Bavarian immigrant who arrived on the West Coast of America in 1853. He came to Portland with his brother, Issac, in 1856 and, with his brother as partner, built a successful butcher's trade. After 1879 he entered stockraising independently and retired in 1904. Bergman, a founding member of the synagogue Temple Beth Israel, established in 1858, lived in the house a little over 25 years before his death in 1916. Although the original Nob Hill neighborhood of Portland has been eroded by modern-day development, it was once the most fashionable place to live in Portland. The neighborhood is located on the Donation Land Claim of Captain John Heard Couch, one of Portland's founding fathers. Couch settled a claim on the west bank of the Willamette River in 1845 after first sighting the spot on a trading excursion to Oregon City in 1842. Couch's claim (No. 52) of 640 acres is generally bounded by the Willamette River on the east and by 21st Avenue on the west and by Thurston and Ankeny Streets on the north and south.Couch platted the portion closest to the river in a true north/south grid system and constructed a family home along the shore of Couch Lake, where Union Station now stands, long since filled. By the 1860s, the waterfront area was a busy commercial district and forced the early residences out. The city's early residential district,thus» developed along Fourth and Fifth Avenues. However, as commerce continued growing, the commercial district expanded. By 1885, Couch had extended the streets to 19th Street, where, between Everett and Johnson Streets, he built homes for all his family members. The Couch family settlement became the foundation for the development of Nob Hill, or the "west end", as it was then called. It was here that the Couch family sought to create in Portland an extension of New England culture and level of sophistication. John Couch was from Newburyport, Massachusetts. The sole remaining physical reminder of the settler is the Couch family schoolhouse (now a residence) at 2063 NW Hoyt. Built in 1884, it is probably the oldest structure in the neighborhood. The Joseph Bergman House, situated a block away from the schoolhouse and just one year later, in date, probably is the second oldest building in the neighborhood and one of the few antedating 1890. After the turn of the century, the Nob Hill area continued to be populated by Portland's wealthy families. It became the location of numerous fash!onablle houses in the Colonial Revival style designedly the leading firm of Whidden and Lewis, who introduced the style to Oregon about 1890. Two important Portland pioneers are associated with the Bergman House. The original owner was Amos N. King (born April 30, 1822 in Franklin County, Ohio), who came to Oregon in 1845, first settling in Forest Grove, then in Corvallis. He moved to Portland in 1849 and purchased 513 acres west of the city which contained a tannery. Portions of that area are now King's First and Second Additions. King's holdings included 40 acres now part of the city's first extensive public park, Washington Park (King sold the City the acreage for $800 an acre in 1871). King had learned the tanning trade in Ohio as a boy and began a business in 1849. His business was so successful that he was able to retire in only eleven years and devote himself to his real estate interests. By 1890, he was reported to be one of Portland's millionaires. He was married to MaLinda Fuller, an Ohio native, in 1846. Mrs. King died in 1887. Amos King died in 1901. The pair had six children. Amos King never lived in the Bergman House. He had the house built as an investment property. The second owner of the house was Joseph Bergman. Bergman was born November 25, 1829 in Bavaria, a son of Nathan J. and Hannah (Heldman) Bergman. He left for the United States in 1853 with his brothers, Isaac and Abraham, arriving in San Francisco in 1855. After about a month, Isaac and Joseph moved to Sacramento, California and entered into the cattle business. In 1856, Isaac and Joseph moved to Oregon and opened one of the first butcher shops in the city. It was located on First Street, between Morrison and Yamhill (he later moved his shop to Second and Washington). They continued that business until 1868, when Isaac went to Alaska. Joseph maintained the meat market alone until 1871 when his brother returned. They again ran the business together until 1876, at which time Isaac moved to Astoria (later to become Mayor of that city). In 1879, Joseph sold the business and went into the cattle business. His long experience as a butcher had made him an excellent judge of the value of stock and he was very successful. He retired in 1904. Bergman married Karoline Bettman, a daughter of Moses and Hannah Bettman, in 1861. Karoline Bergman came to the United States in 1860, arriving in New York and departing immediately for Portland, Oregon. Joseph and Karoline Bergman moved into the house at 2134 NW Hoyt Street (the original address was 694 Hoyt) in 1890. They had eight children. Three died in childhood and Michael L. , an attorney, died when he was 22. Clara, Samuel K. , Nathan J. , and Ida continued to live in Portland. The house was occupied by Bergman's heirs until 1967. Bergman was a member of the United Workmen and was a charter member of the Temple Beth Israel, which was organized in 1858. He served for twelve years as a volunteer fireman from 1858 to 1870, acting for some time as the assistant chief and for a time as foreman. Bergman died on May 19, 1916 at the age of 86. He is buried in the Beth Israel Cemetery. The funeral was conducted in the family house on Hoyt Street by Rabbi Jonah B. Wise on May 22, 1916, at 11:00 a.m.